We have a complete laboratory in-house, equipped with sophisticated analytical instruments where our raw materials, in-process and finished products are rigorously tested. Each batch is fully characterized to meet customer requirements & specifications. 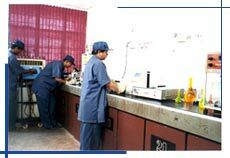 Our stringent quality control has resulted in us being ISO 9001:2000 certified. The list of analysis instruments includes Atomic absorption Spectrophotometer, UV Spectrophotometer, Colour Matching System, HPLC and other regular kind of instruments and glass apparatus. Its stringent quality control policy has resulted in NARMADA being ISO 9001:2000 and HACCP, KOSHER Certified. Concern for the environment is of paramount importance at Narmada Colours, we have the most EFFICIENT EFFLUENT TREATMENT PLANT, which more than fulfills the requirements of the Pollution Control Board of the State. We take pride in this commitment.